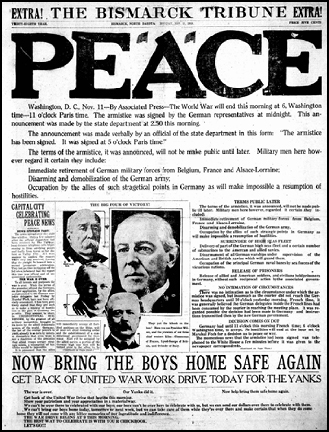 Image: “PEACE,” Bismarck (N.D.) Tribune, p.1; digital images, Chronicling America: Historic American Newspapers, Library of Congress (http://chroniclingamerica.loc.gov/ : accessed 10 Nov 2013). A roll call to be proud of! It is wonderful to honor them all. Thanks, Colleen — all of us are proud of all of them!